But wow, I was so wrong! It opened with a huge bang. It was action packed from the start, and Spidey’s one liners were spot on. Marvel really has that web slinging and flying through the buildings thing down. It’s breathtaking to watch. Garfield does the voice over work with such excitement that you know he truly loves being Spider-Man. They also flawlessly show him using his “spider sense” several times throughout the film and director Marc Webb hits that note every time with great accuracy. Our plot begins with another day in Spider-Man’s life, as he is saving the great city of New York and running late to a very important event. There is a great scene of him on the front of a truck and he is on the phone with his lady love, Gwen Stacy, while he is still in the thick of things. It was quite funny. He has the chance to save an awkward young man named Max Dillon, played by Jamie Foxx, who gets excited because Spidey notices him. Things start happening when Gwen is at her job at Oscorp, and meets Max Dillon who turns out to be a genius electrician who also works at Oscorp. Emma Stone comes back as Gwen Stacy, and she is adorable for sure, but is she really a that big of a teenage prodigy? I mean, a possible degree at the age of 18 in molecular medicine? These are some of the finer plot points that are mildly unbelievable. She does well though, inflaming Spider-Man and keeping him dedicated. A major-minor role here goes to Sally Field as Aunt May. She really gets you going as Peter’s last living relative and she is so believable you wish she had more screen time. There is an accident that turns Max Dillon into Electro, and after that, the movie is a little less enjoyable. 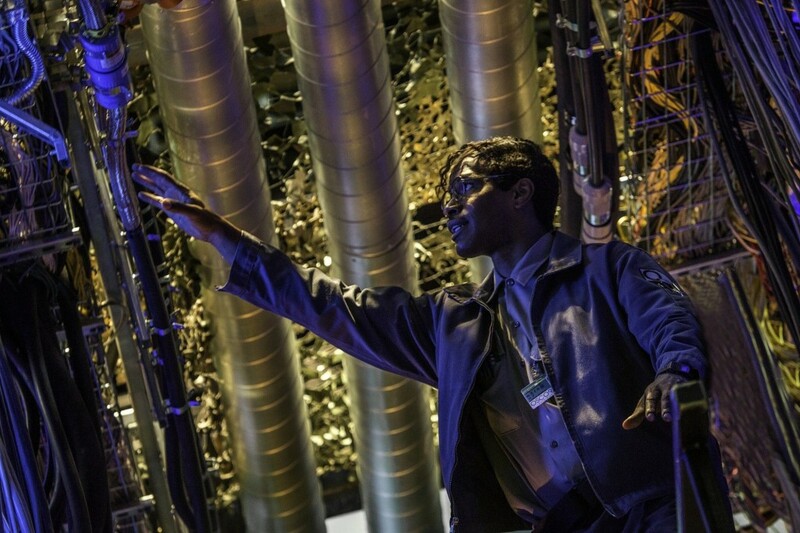 I feel that Jamie Foxx looked kind of ridiculous as Electro and was almost over the top. They also had this music that indicated he was coming onscreen. It was horribly loud, overdone, and totally unnecessary. I get it, he’s evil now and well, he’s after Spider-Man. Do we have to have a loud ominous sound every time he pops up? No, we don’t. Dane DeHaan plays Harry Osborn and the Green Goblin and he is beautiful. This kid’s eyes are what sell it and he commits to the relationship with Peter from the start. You can see all of the emotion right there, right behind his eyes! My biggest problem with this movie was the ‘too many villains syndrome’. Green Goblin, Electro and the Rhino (who you see at the very end for a split second) should all have their own story lines, not a combined line. It makes for a long movie and implausible finish. I am glad they went with the hard sell in this movie though, as there is a plot point that makes Spider-Man tougher, and in the future, we can expect a much stronger and fiercer web-slinger. And perhaps, maybe an Avenger. The 3D in the film was more like “what can we throw at you,” rather than adding a lot of depth at the screen, and the extra footage at the end of the movie was cut. So we didn’t get it. But as always with Marvel films, be sure to stay to the end of the credits for a bonus scene or two. 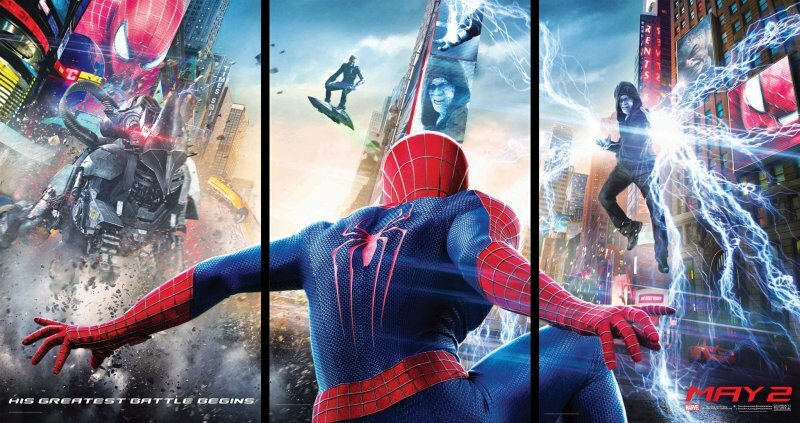 ‘The Amazing Spider-Man 2‘ was ver entertaining, but I felt it was a tad too long. But I’m glad it exceeded my expectations and made me want to apply for a job at Oscorp. This entry was posted on Thursday, May 1st, 2014 at 10:32 am	and is filed under Comics, Film, News. You can follow any responses to this entry through the RSS 2.0 feed. You can skip to the end and leave a response. Pinging is currently not allowed. « Podcast #33 – ‘Star Wars’ Discussion! !